Ben Macallan is a penname of Chaz Brenchley who also writes as Daniel Fox. Read excerpts and learn about his other books at Chaz Brenchley’s website or Daniel Fox’s website. Moshui, the Books of Stone and Water — (2009-2011) Publisher: The island of Taishu may be a remote outpost of empire, but it is also the only source for true jade, which is far more than a symbol of imperial power. Rebellion has driven the young emperor from his capital; eventually, inevitably, he leads his defeated army to Taishu, a last stand for a lost cause. Crossing the strait, he encounters a fisher-girl and claims her for himself, brief comfort for a lonely and frightened boy. There are known to be pirates in the strait, drawn by the lure of jade-ships, fabulous wealth. There is said to be a dragon under the water, chained there long ages since. A pirate crew slays the monks who supposedly keep the dragon quiescent; at the same time they free a slave, who howls when his chains are cut. And takes possession of a cabin-boy, puts him in chains, cuts curious signs in the iron… That boy has seen the dragon once already; now he feels her stirring. In his mind. Most epic fantasy written in English has its basis in Western culture. While the worlds created in these books are not our world, they are generally recognizable: the use of language is comfortable, the foods are what we or our ancestors ate, the customs are basically familiar. Even mythological creatures look the way we expect them to, so that unicorns have horns and dragons have wings. When there are exceptions to these rules, the author is certain to provide an explanation, and the exception is often integral to the tale. Why are the second books of trilogies so difficult? 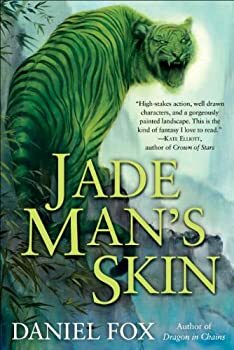 Jade Man’s Skin is the second book of MOSHUI: THE BOOKS OF STONE AND WATER, a series set in an alternate China where dragons are real and jade has the power to make an emperor nearly invincible. 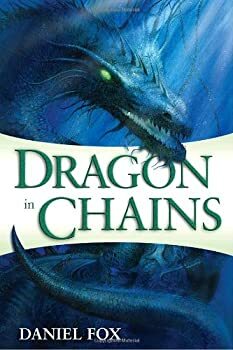 I greatly enjoyed Dragon in Chains, the first in this series. And I can’t say that I didn’t enjoy Jade Man’s Skin; only that I enjoyed it less. It seems to start somewhere and end somewhere, but there is a great deal of chatter in between. PLOT SUMMARY: Whatever they thought, this was always where they were going: to the belly of the dragon, or the belly of the sea. More by chance than good judgment, the young emperor has won his first battle. The rebels have retreated from the coastal city of Santung — but they’ll be back. Distracted by his pregnant concubine, the emperor sends a distrusted aide, Ping Wen, to govern Santung in his place. There, the treacherous general will discover the healer Tien, who is obsessed with a library of sacred mage texts and the secrets concealed within — secrets upon which, Ping Wen quickly realizes, the fate of the whole war may turn. Outremer — (1997-2003) Publisher: The desert kingdom of Outremer is ruled by a harsh king whose will is enforced by warrior-priests called Ransomers. But when a young Ransomer in training meets the daughter of the King’s Shadow, the reign of blood and magic will be changed forever. Selling Water by the River — (2006-2007) Publisher: For a thousand years, the great city of Sund stood impregnable while its enemy, Maras, remained outside the walls. Then the Marasi harnessed the powers of magic. Erecting an otherworldly bridge whose foundations were rooted in sorcery, the Marasi overran the walls of Sund, and threw them down. In the city of Maras-Sund, magic has been outlawed. Yet there are children being born with raw magical talent-and there are those who would rally behind them to rebel against their hated overlords. 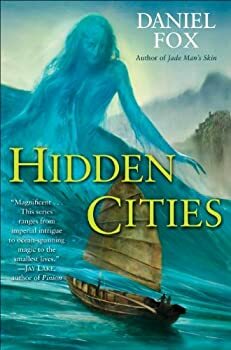 Issel, a young water-seller from the poorest part of the city, possesses the gift for magic. And when he is recognized for his talents, recruited, and trained in the arts, his abilities may hold the key to his people’s salvation. Paradise — (1994) Publisher: They call it Paradise — an inner-city danger-zone, starved of resources, starved of hope; run-down housing, run-down lives. Then, a miracle happened. A dying boy was healed by the touch of a charismatic young man. And that’s only the beginning. Richard brings light into the darkest places. Dispossession — (1996) Publisher: Jonathan wakes up in hospital and is told he has been involved in a car crash. He doesn’t remember the last three months, and the doctors say he’s only been there three days. He also doesn’t remember the woman by his bedside who says she is his wife, but she has the pictures that seem to prove it. Shelter — (1999) Publisher: Rowan Coffey is 19 when one of his friends is murdered. Rowan, who had no alibi and was under suspicion, has been knocked off-balance by the experience and leaves university seeking the comfort and familiarity of his home. But his home is under threat. Rotten Row — (1999) Publisher: A novella. Rotten Row is the worst place we’ve made. Humankind can travel to the stars — but only if you’re sure of yourself. Content to be flung as a datastream through space, flitting from male to female, dark to fair, tall to short to broad, one random discard body to the next. Those who go are the Upshot, rare individuals subject to their own rigid laws. And then there’s Rotten Row. Outcast from the Upshot community, in breach of all codes, in Rotten Row people design their own bodies and sell them on for re-use after. Outlandish bodies: furred and feathered, winged and hooved and worse. duLaine is an artist, but all art is about identity; where one blurs into the other beyond physical limits and legal restraint, what is art worth and how can anyone be certain who they are? duLaine travels to Rotten Row in search of answers, and finds himself snared by passions, plots and betrayals beyond his worst imaginings, far beyond his ability to control. CLICK HERE FOR MORE TITLES BY CHAZ BRENCHLEY. Desdaemona — (2011-2012) Publisher: Jordan helps kids on the run find their way back home. He’s good at that. He should be — he’s a runaway himself. Sometimes he helps the kids in other, stranger ways. He looks like a regular teenager, but he’s not. He acts like he’s not exactly human, but he is. He treads the line between mundane reality and the world of the supernatural, including the awesome Powers That Be. Desdaemona also knows the non-human world far too well. She tracks Jordan down and enlists his aid in searching for her lost sister Fay, who did a Very Bad Thing involving an immortal. This may be a mistake — for both of them. Too many people are interested now, and some of them are not people at all! Ben Macallan’s urban fantasy debut takes you on a terrifying journey, lifting the curtain on what really walks our city streets.